Galangal (/ˈɡæləŋˌɡæl/) is a common name for several tropical rhizomatous spices. 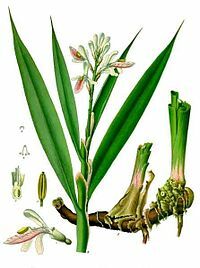 Various galangal rhizomes are used in traditional Asian cuisines, such as Thai and Lao tom yum and tom kha gai soups, Vietnamese Huế cuisine (tré) and throughout Indonesian cuisine, as in soto). Polish Żołądkowa Gorzka vodka is flavoured with galangal. 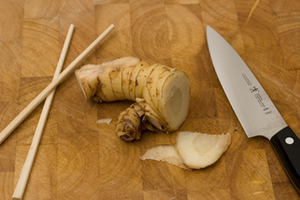 While all varieties of galangal are closely related to common ginger, and all exhibit some resemblance to the hot, spicy flavor of ginger, each is unique in its own right, and galangals are not typically regarded as synonymous with ginger or each other in traditional Asian dishes. In ethnobotany, each of the various galangals is attributed with specific medical virtues. In commerce, galangals are commonly available in Asian markets as whole fresh rhizome, or in dried and sliced, or powdered form. 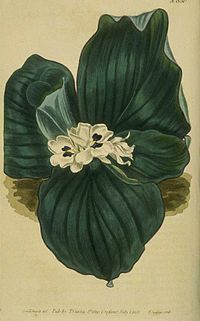 ^ “galangal”. Oxford English Dictionary third edition. Oxford University Press. November 2010. Retrieved 19 December 2018.